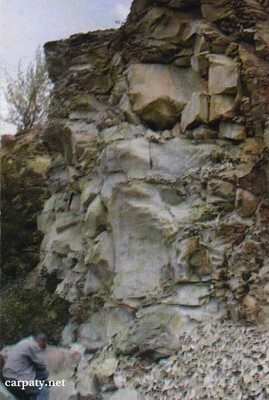 Regional Information Center "CARPATHIANS" » SOKYRNYTSKE ZEOLITE OUTCROP. 48° 08′ 34″ N lat. ; 23° 24′ 51″ E long. North from Sokyrnytsya village in the operating zeolite quarry more than 250 m long and up to 10 m deep there are exposed zeolites (clinoptilolite, mordenite and other zeolite group minerals) that formed by metasomatic alteration of Late Badenian rhyolite tuffs some tens of meters thick. Due to high sorption properties zeolites are being used as mineral fertilizers for soil upgrade and also as cattle and poultry food ingredients. After Chernobyl accident zeolites also are widely used as high-efficiency isolation material which prevents groundwater radioactive pollution. 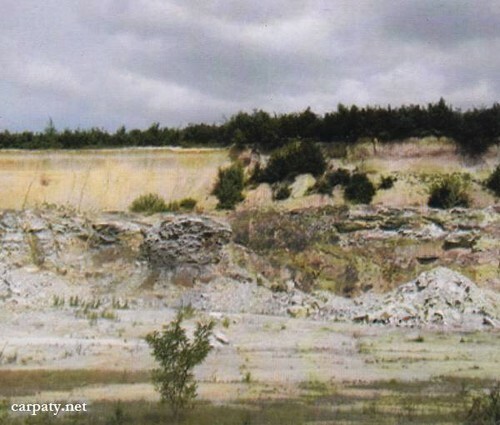 Close to the quarry is located arranged spring of crystal-clear (traces sorbing by zeolites) water. Accessible by motor-car — 2.5 northward from the church in Sokyrnytsya village by azimuth 25°. « CHERVONA SKELYA (“RED CLIFF”) STREAM.